Leather furniture, like upholstered furniture, requires regular cleaning to keep it looking its best while extending its life. Our leather cleaning, repair and conditioning services in the Brisbane Northside area are designed to protect your investment in fine leather pieces and keep them looking like new. It’s not a service customers always realise they need—there’s a common misconception that leather is somehow impervious to dirt and damage. But in reality, if you have your leather professionally cared for on a recommended schedule, it will be cleaner, look better overall and last longer. Providing leather repair and cleaning in both home and commercial settings, we have earned the trust of our customers by treating their leather furniture with great care as well as top-of-the-line materials and techniques. The bottom line is that even when leather—particularly dark leather—hides its stains and signs of wear-and-tear effectively, that doesn’t make it clean. Customers often watch in amazement as we extract dirt from their favorite leather sofa that they assumed was (more or less) clean. Meanwhile, imbedded dirt or soiling will age the leather prematurely, and small cracks, tears or punctures eventually spread until they can’t be overlooked any more. Protecting your leather furniture and repairing it when necessary is far more cost effective over time than simply wearing it out for lack of proper maintenance. 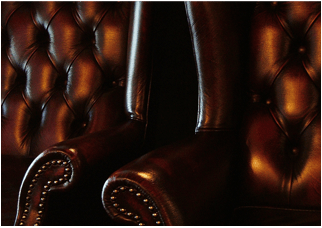 And our professional leather conditioning will keep it smooth and supple for years to come. Finally, our specialty services include leather re-colouring to match the original colour of the leather after a hole or hear is mended or to re-colour an entire piece of furniture. So often, customers underestimate what a skilled leather repair technician can do to fix tears and holds in their favorite furniture. Many assume they’re either stuck living with the damaged spot or replacing their furniture altogether, so it’s our pleasure to let them know that we can not only repair the leather but match the colour as well, so the repaired area is almost completely camouflaged. Claw marks? Cigarette burns? Small tears? No matter what the cause, we can usually repair it like it never happened. Like our upholstery services, we offer leather cleaning, repair and conditioning not only in home and commercial settings, but our leather-care service extends to your car as well, so you don’t have to worry that those luxury leather seats you chose when you bought your car are going to wind up dirty or damaged with no hope of repair. Your car seats are subjected to a lot of dirt and wear and tear just like other leather furniture. They deserve the same care to keep your seats comfortable, extend the life of the leather and keep your car interior looking great. Please contact us today about all of our leather cleaning-and-care services. Our service is professional and courteous and our prices competitive. We look forward to hearing from you!